Seasonal Rise | ECIR Group, Inc. 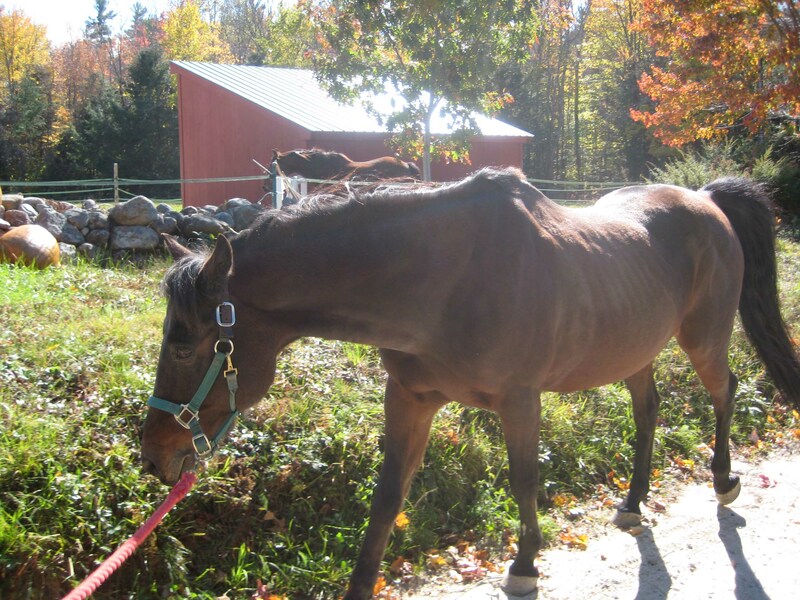 Seasonal Rise is a term now used to describe the Fall seasonal ACTH and resulting insulin and glucose fluctuations in horses with PPID/Cushing's Disease. Owners and veterinarians have long recognized that horses with PPID do better symptomatically in the Spring and Summer than in the Fall and early Winter. Before a Seasonal Rise was identified, Fall laminitis was often blamed on high sugar and/or fructan in grasses. Many horses over the years have presented on the ECIR Group with these same seasonal patterns of laminitis within the period of August to December — the months of Fall in the northern hemisphere. However, the ECIR Group documented horses becoming laminitic without access to grass and without any change in the low-sugar and starch insulin-resistance (IR) diet. Dee, an ECIR Group member, along with her veterinarian, who suspected hormonal influences for the Fall laminitis Dee's horse Cabby experienced, documented a rise in ACTH and a worsening G:I Ratio in Cabby back in 2004. In the southern hemisphere, seasonal rise takes place from February to May. Variation in plasma adrenocorticotropic hormone concentration and dexamethasone suppression test results with season, age, and gender in healthy ponies and horses. Donaldson MT, McDonnell SM, Schanbacher BJ, Lamb SV, McFarlane D, Beech J. Department of Clinical Studies, New Bolton Center, School of Veterinary Medicine, University of Pennsylvania, Kennett Square, PA, USA. The purpose of this study was to evaluate the variation in plasma adrenocorticotropic hormone (ACTH) concentration and dexamethasone suppression test (DST) results with season, age, and gender in healthy, pony mares (n=15) and pony stallions (n=14) living under semiferal conditions and horse mares (n=10) living at pasture. Plasma ACTH concentrations were measured in September 2002, and in January, May, and September 2003. DSTs were performed in January and September 2003. Plasma ACTH concentrations in September 2002 and September 2003 were similar and were significantly greater than in January and May (P < .001). Plasma ACTH concentration was within the reference range for 38 (97%) of 39 subjects in January, for 39 (100%) of 39 subjects in May, for 2 (5%) of 39 subjects in September 2002, and for 3 (8%) of 39 subjects in September 2003. DST results were within the reference range in all subjects in January and were within the reference range for 29 (74%) of 39 subjects in September 2003. Plasma cortisol concentration at the end of the DST was significantly greater in September than in January (P = .002). Age was positively correlated with plasma ACTH and plasma cortisol concentration at the beginning and end of the DST Within the same season, plasma ACTH concentration in pony mares, pony stallions, and horse mares was not significantly different (P > .05). Seasonal changes in plasma ACTH concentration and DST results should be considered when interpreting endocrine test results. To be diagnosed a "full blown" PPID horse, the ACTH should be elevated all year. The ECIR Group has followed many early PPID horses as they develop year-long ACTH elevations. Gradually, sometimes years before the year-round elevated ACTH, early PPID horses can have exaggerated Fall ACTH rises that are high enough to push them into Fall laminitis. 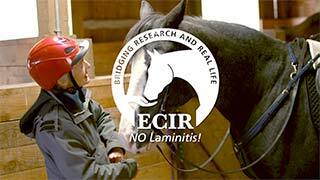 Fall laminitis is often the very first sign of early PPID — long before the truly obvious coat changes, a symptom the ECIR Group now considers an occurrence in more advanced stages of PPID. The ACTH rise increases with age but there are few specific details on this yet. For example, it's unknown if ACTH increases more in horses that are going to develop PPID in the near future or in horses that are Insulin Resistant (IR). It's also unknown if there is a "threshold" ACTH that might mean the horse should be treated during the Seasonal Rise with pergolide. Unfortunately, the only way to definitely know for the individual horse might be the hard way — with laminitis developing. Higher ACTH means higher cortisol production. Cortisol itself makes the veins in the hoof less responsive to vasodilators. This alone is probably not enough to trigger laminitis (although it could trigger foot pain if the horse already has compromised circulation). Cortisol also induces insulin resistance, or worsens it if it is already present, which correlates with the documented PPID horses on the ECIR Group that also develop increased insulin and G:I ratios. Since every horse has a different starting point, every horse will have a different risk factor from the Seasonal Rise in ACTH and cortisol. Which horses should be tested and/or have pergolide adjusted? Any horse with a history of late Summer or Fall laminitis unexplained by diet. They are at very high risk of having it again. Known PPID horses, even if controlled at other times of the year, should be checked. PPID horses can have extremely high ACTH in the Fall if their pergolide dose is not adequate. This is a laminitis risk. Any IR horse in their teens or older may also develop an exaggerated ACTH rise. Any horse in their teens with a collection of early PPID symptoms starting in late Summer or early Fall, such as unexplained (by diet or work) obvious weight loss, increased water consumption and urination, changes in crest, udder swelling in mares, or change in behavior/attitude or activity level. How does Seasonal Rise affect diagnosis of PPID? Although several laboratories and authors have suggested ceilings for the Seasonal Rise in normal vs PPID horses, there are no universally agreed upon numbers for Seasonal Rise ACTH levels that clearly diagnose a PPID horse. What is known is that the younger the horse, the lower the rise, and that "full blown" PPID horses can have dramatic increases, to 1,000 or higher. A first-time diagnosis of PPID may be difficult in late Summer/Fall based on ACTH alone, but may be diagnosed if a constellation of obvious PPID symptoms is also present. Early PPID cases can go through years of exaggerated Seasonal Rises — and laminitis — in late Summer/Fall with no glaring coat changes and normal testing other times of the year before they progress to "full blown" PPID. However, in many ways it really doesn't matter whether the horse tests abnormal year-round. The immediate challenge here is avoiding late Summer and Fall laminitis. Therefore, points 1 - 4 above apply for testing guidelines and diagnosis during the Fall. Since loss of IR control is what is hoped to be avoided by measuring for exaggerated ACTH, it is also reasonable to monitor insulin and glucose instead. If IR is worsening without any other change in diet or exercise levels, it's a pretty safe bet the seasonal ACTH rise is the issue. (Other possible causes may be Lyme disease flare up.) If an individual horse is normal (normal G:I ratio) other times of the year but is in his/her teens, you could use insulin and glucose levels as your initial screening test. Test in September, the peak of the ACTH rise and if the G:I ratio stays normal, skip ACTH testing for now. If the G:I ratio lowers, test ACTH or try a trial of pergolide to see if it normalizes. These very, very early cases can probably be weaned off pergolide in December. Is there a link between Insulin Resistance (IR) and horses going on to develop Cushing's Disease? It has been suggested that the oxidative stress that destroys the dopamine producing nerves in the brain could be a link between IR and PPID. Equine pituitary pars intermedia dysfunction (PPID) is a well-recognized disease in aged horses and ponies, yet the etiology and pathophysiology of this condition remains poorly understood. Immunohistochemistry of formalin-fixed pituitary tissue was used to demonstrate dopaminergic neurodegeneration and oxidative stress in the pars intermedia in horses with PPID. The role of oxidative stress in the pathophysiology of this disease is a new finding. Further research is warranted to elucidate the mechanism resulting in oxidative stress in horses with PPID. However, the PPID horses in this study with oxidative stress in the brain did not have evidence of systemic oxidative stress. Treating exaggerated ACTH levels in horses experiencing laminitis or at risk of laminitis is reasonable. Low doses of pergolide (0.5 - 1 mg) are generally a good starting point at this time of year when horses are not showing elevated ACTH at other times of the year. Horses can be weaned after December or even as late as April, then tested again to see how their ACTH levels are during other times of the year. It is important to note that Seasonal Rise is not just about the blood work — it's important to always monitor the horse, as well as blood work. Symptomatically, there are so many subtle changes with PPID not picked up with current blood diagnostics, that often it is the early cases of PPID that owners and veterinary practitioners miss. Fall laminitis in adult horses with or without obesity or laminitis occurring late in life for the first time; loss of topline and potbelly appearance; weight loss; increased appetite; lethargy; skin sensitivities; minor shedding changes; worsening insulin resistance — all these commonly occur before the more recognizable and somewhat advanced non-shedding, curly-coat stages.